“Gràcia! Arriba! Carnaval ja ha arribat! Gràcia! Arriba! Carnaval ja ha arribat!” That’s how I was rudely awoken from my Saturday afternoon siesta – shouts from the start of the Carnaval parade in the street below. “Gràcia! Get up! 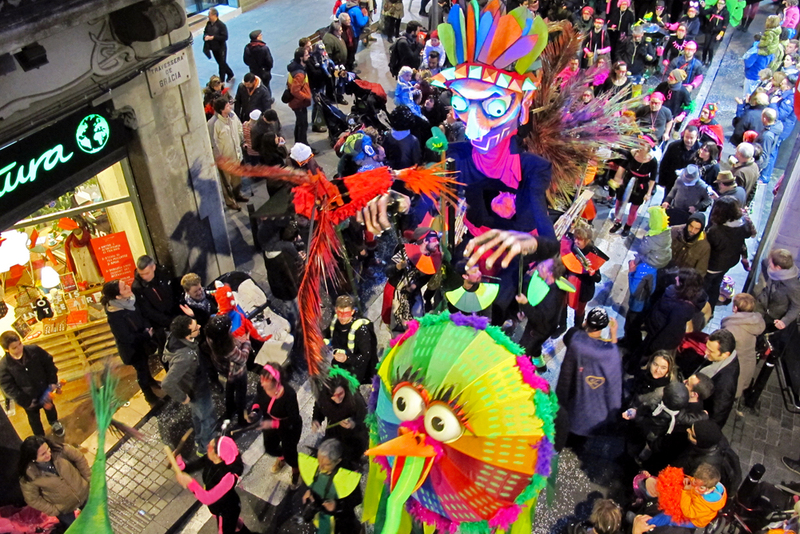 Carnaval has arrived!” is what the Catalan chant translates to, and it certainly made me get up. From my apartment’s little Juliet balcony, the street below was filled with excited spectators watching the slowly approaching parade floats make their way down the street. Gràcia is a little neighborhood in Barcelona; actually, it’s my personal favorite little neighborhood, and the one I chose to live in when I had to change apartments. It used to be a separate village until the city grew so big it swallowed it up. Today, it’s not quite part of the city center, but it’s so close to it that it just grazes the top edges of the most central part. 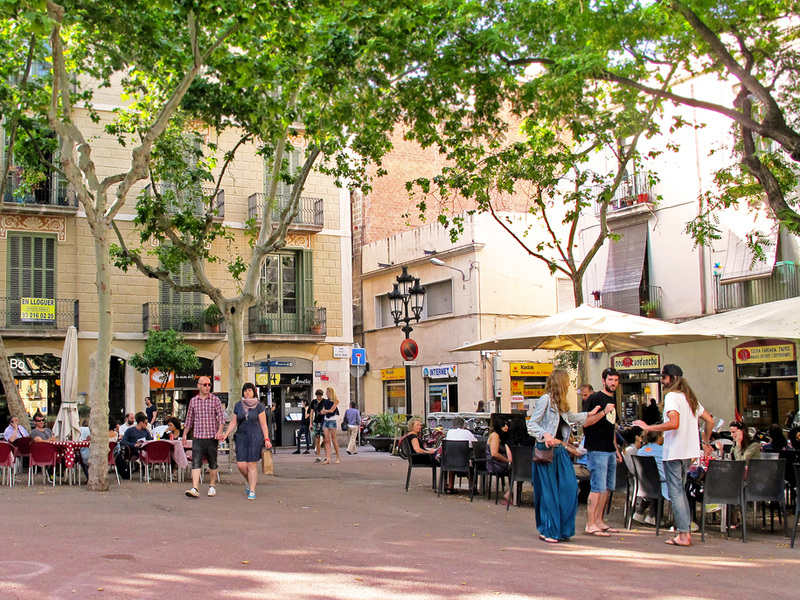 Having said that, Gràcia still maintains some qualities that are very much like the little village it used to be. 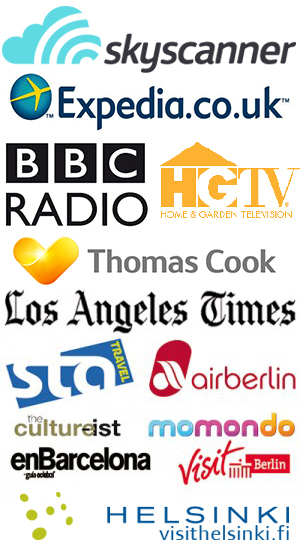 You’ll hear residents saying they’re going “down to Barcelona”, as if it were still a different city. If you meet someone from Barcelona who grew up in Gràcia, they may let you know they’re from Gràcia, not Barcelona. 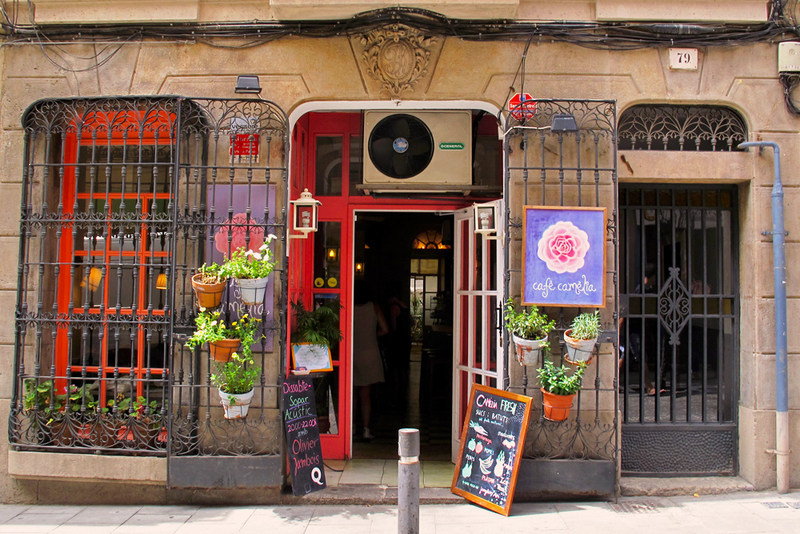 Once people move to Gràcia, it can be tricky to get them to leave the neighborhood (present company included!). There’s a local market that feels very much like a tiny town market, and residents in the streets and shops happily greet each other, making it clear that they’ve known each other for years. You have to pay attention as you walk along the tiny sidewalks, as the people walking in front of you may suddenly stop to have a conversation with somebody they run into. But you can really feel the village atmosphere at celebrations, which are often kept to the barri only; the parades and parties never bleed over into the next neighborhood. 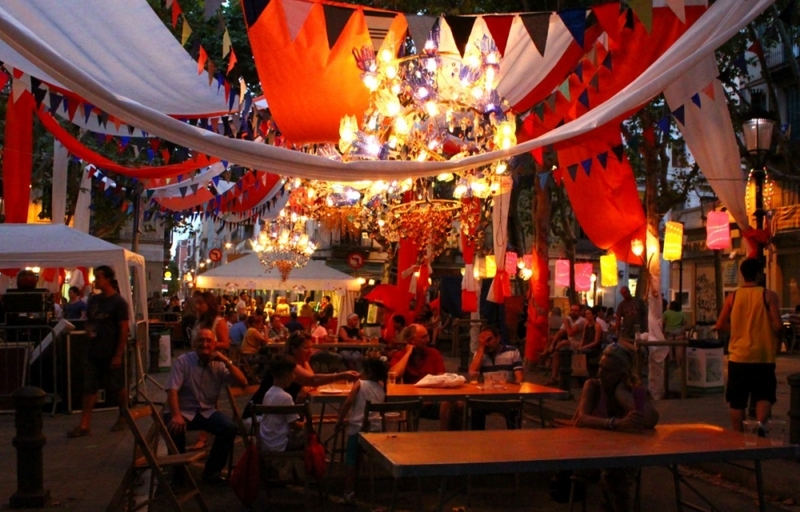 Barri isn’t a typo, by the way – it’s Catalan for neighborhood, and Gràcia loves to celebrate all kinds of Catalan festivals and parties. 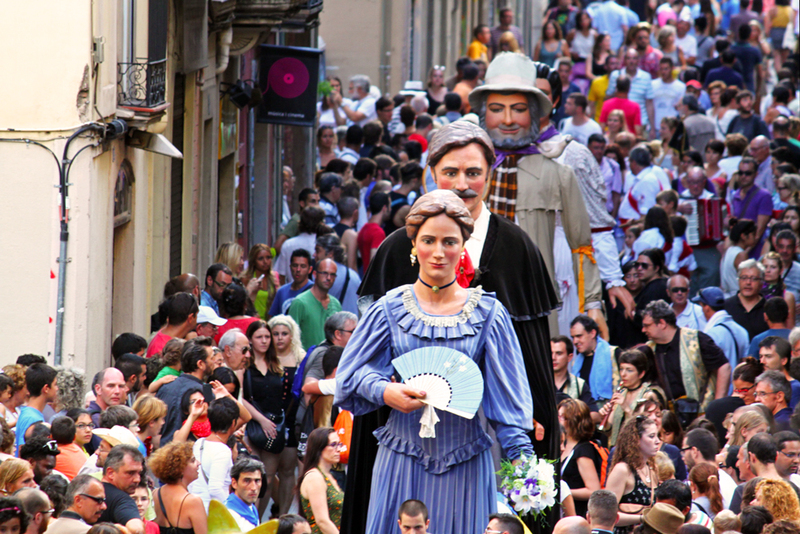 From castellers to correfocs, if you want to see a traditional celebration here, it’s probably only a matter of time. 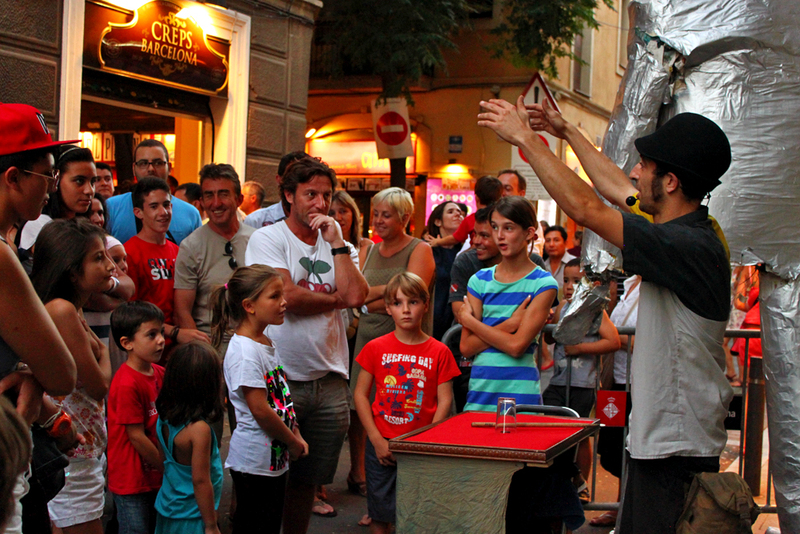 You can tell that a festival is coming your way in Gràcia because it’s usually preceded by extremely loud noises. It’s not a proper festival here until somebody starts banging a drum, setting off fireworks, or playing music at top volume…or ideally, a combination of all three. 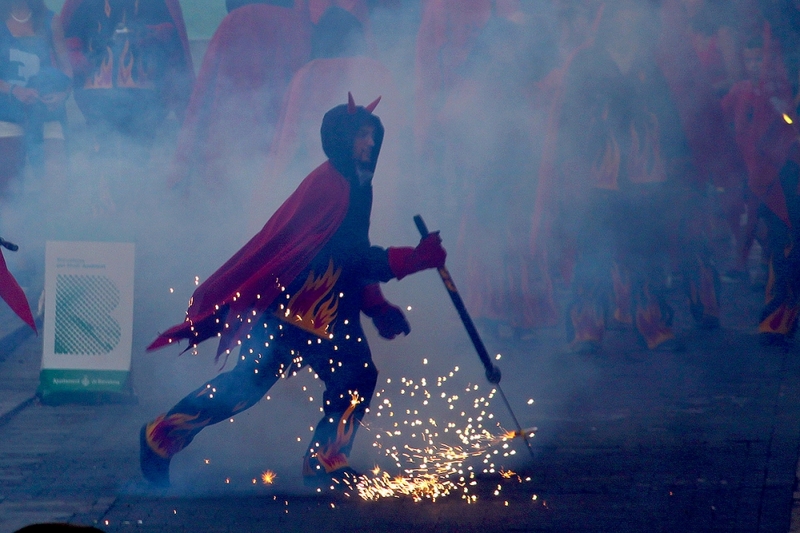 The correfocs are always a noisy affair. Subtlety is decidedly not an element of these kinds of traditional celebrations. If you’re in the neighborhood, you might as well go downstairs and join in the fun, because you won’t be able to do much else with the racket going on outside. 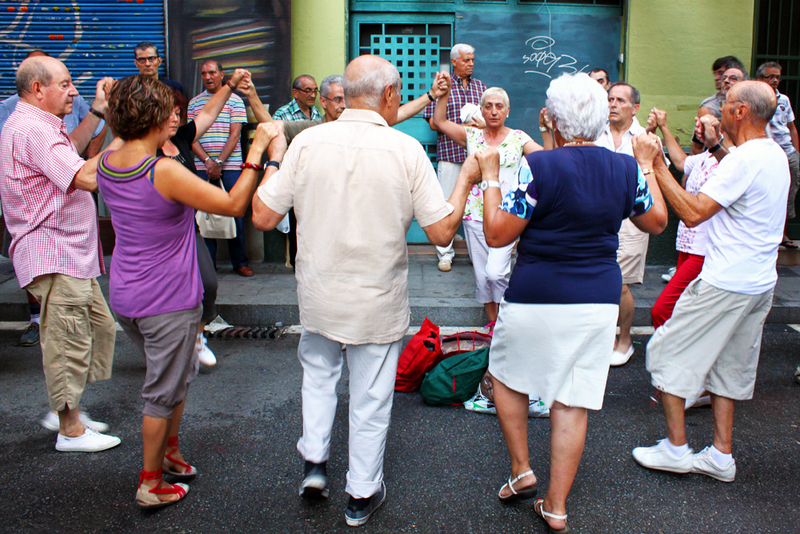 Whether it’s because the fiestas are impossible to ignore or just because locals love a good time, everyone turns out for the festivals, from the tiniest babies to the wrinkliest abuelos. It doesn’t really matter much what kind of festival it is; you’ll see people of all ages out and enjoying it. Even at a midnight punk concert, there’ll be a toddler or two on hand rocking out with the crowd. Although the festivals can be a figurative headache (and can definitely cause a literal one) when you have things to be doing, they’re actually one of the loveliest parts of living in Gràcia. You can really see how they’ve conserved lots of very traditional elements in a completely modern setting, and the mixture works perfectly. Dancing the ‘sardana’ in front of a graffitied wall. One tradition that hasn’t changed over the years is the love for getting a big group of friends, family, and neighbors together to celebrate the big calendar days of the year. That might be a calçot barbecue in the springtime, where everyone drags tables and chairs down into the street to eat together. Or maybe it’s a display of the strongest and tallest casteller towers on a sunny fall afternoon. 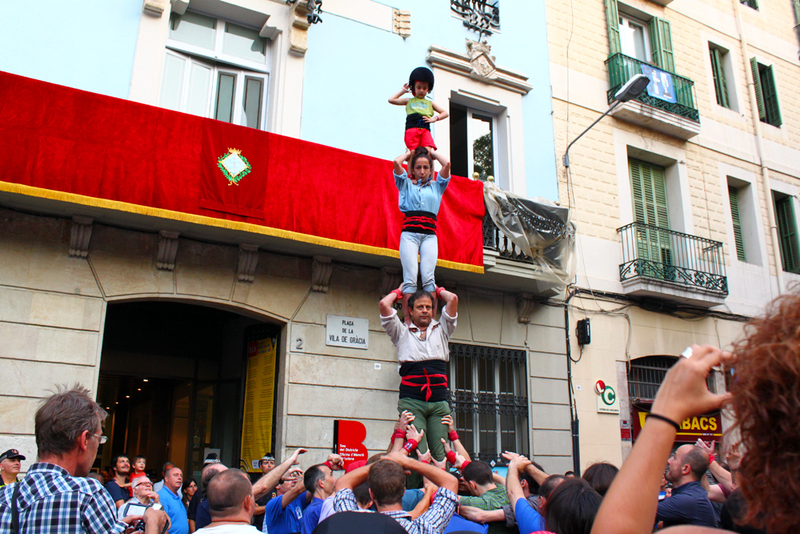 And of course, the highlight of all of Gràcia’s neighborhood parties is the Festa Major de Gràcia, a week-long wild celebration in the middle of the August heat. 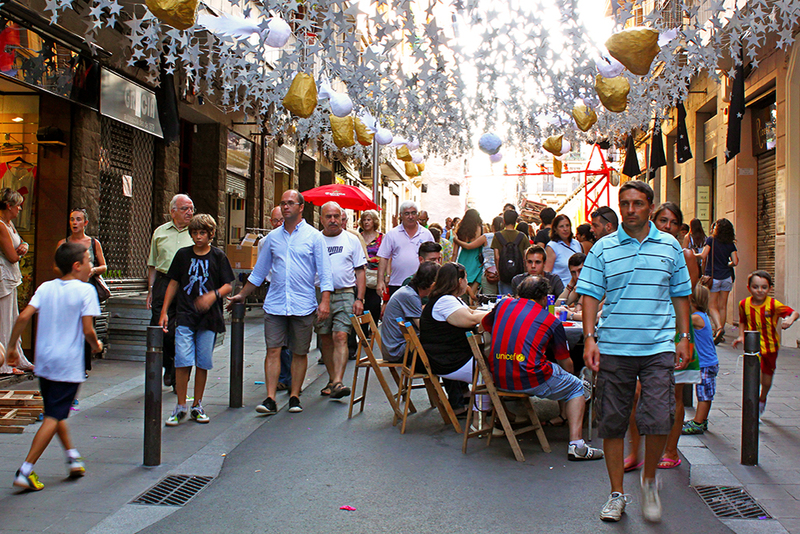 A neighborhood meal during the Festa Major. Magic! 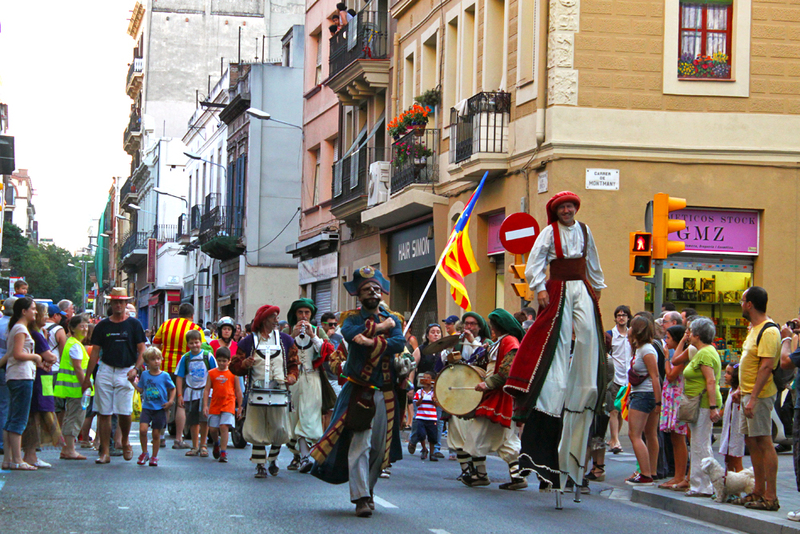 From last year’s Festa Major. And that fantastic sense of community is the thing that Gràcia’s strictly Catalan traditions share with a lot of my favorite celebrations in other regions of Spain. Even though the ways and reasons each region celebrates are different, most of the major festivals are all about enjoying them with your favorite people – and what could be better than that? Looks great fun, some excellent pictures too. I love Barcelona, which is the place Mrs Wilbur and I chose for our honeymoon. I am looking forward to my trip to the Camp Nou in March. Camp Nou is great! I’ve never been to the museum section of it, but the stadium is quite impressive just because it’s so massive. Love the ‘sardana’ dance! 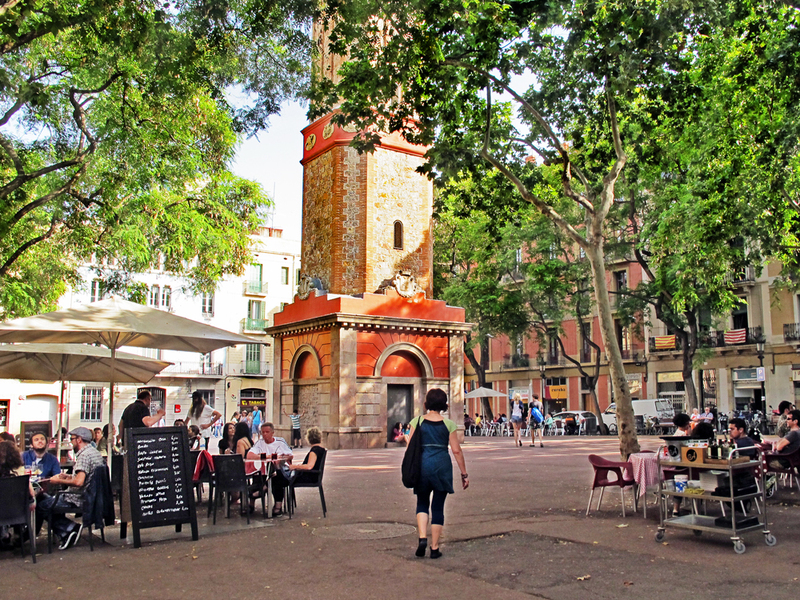 Really enjoyed reading this post – peppered with little bits of catalan – looks like a lovely community. Thanks, Andrew! It really is a lovely community, and there’s such a community feeling to it as well. I’d love to spend Carnival in Spain! 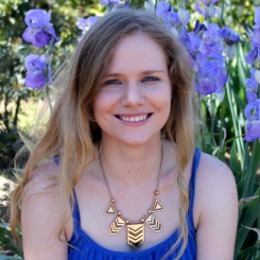 Thanks for sharing your story and a little more about this area. I went through it when I was in Barcelona years ago but definitely will have to go back and explore it with more detail. It’s a really fun celebration here, it’s basically an entire week of Halloween. I love it! We miss living in London because of the bonds we developed residing in its various villages. Gracia sounds amazing. We’ll be sure to visit next time we’re in Barcelona. I love cities that have neighborhoods that are like their own separate villages – it makes them so much more interesting. 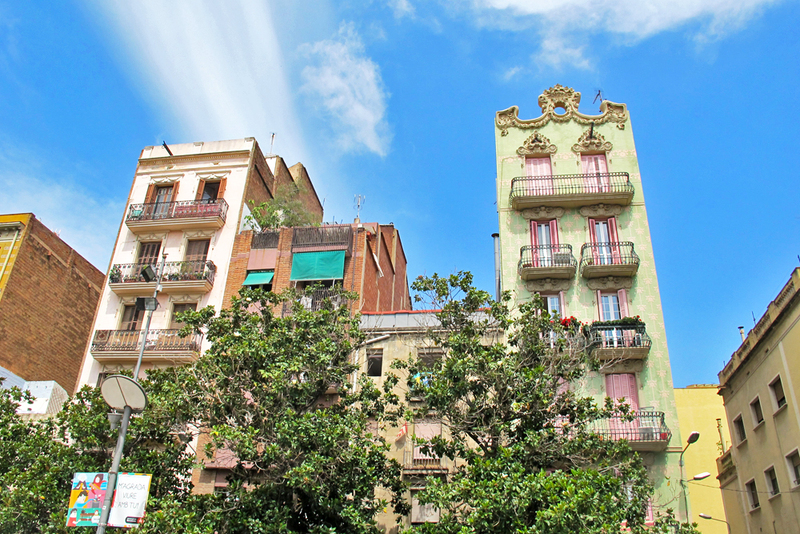 Gracia looks like an awesome neighborhood. I love the civic pride that the residents have. Plus, it looks like a perfect place to celebrate a holiday or festival. It’s perfect for festivals, especially because the locals get really into it! Ah..i just love Barcelona. I think i will go again this year and new tips are always welcome! Thanks, Josh! May is really great here, and there’s actually a big festival over in Girona in the first week or so of the month called the Temps de Flors. It’s a nice little day trip if you have time. 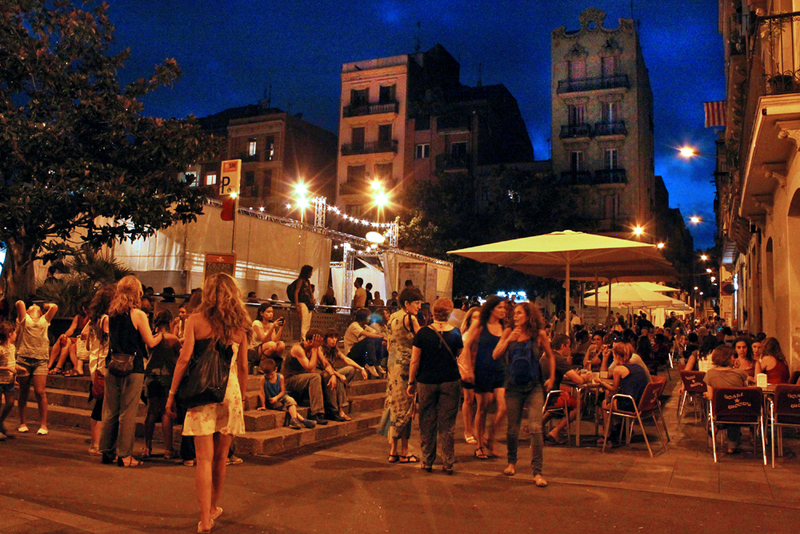 Gràcia is a lot like Triana – close enough but feels worlds away! Yup, that’s exactly what it feels like! The town looks really interesting. I’m coming to Barcelona soon and this is just a new interesting place to look. Great photos as well, Jessica! Thanks, Maria! It’s a really interesting part of the city. Even though there aren’t many top sights here to see, it’s nice to take a stroll through the neighborhood just to get a feel for the vibe. That looks like a fun time and quite different than the carnival I just experienced in Germany. I would love to compare the two! Well, only the first photo is from Carnaval – the rest are actually from celebrations held throughout the year. 🙂 Or do they not do parades for Carnaval in Germany? Love the colour and vibrance of Garcia! I find it fascinating whenever a city has regional divides and distinctive identities. Will have to veer off the path and to the beauty of Garcia! Me too, I love seeing different sides of a city in its different neighborhoods. Great post Jess! I love Gràcia and Barcelona. 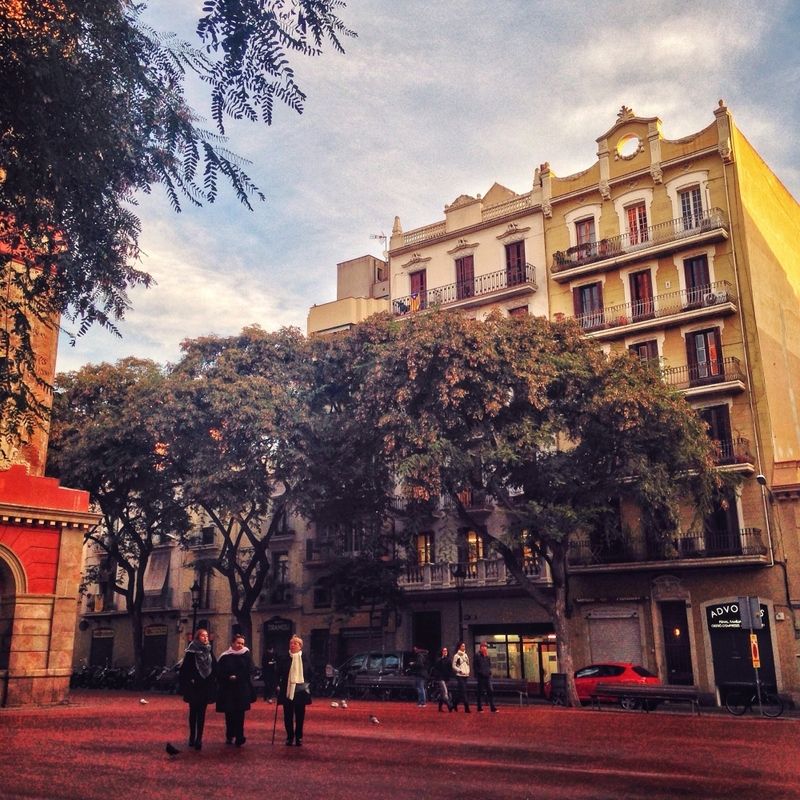 I’m from Spain and Barcelona is one of my favorite cities…cosmopolitan and full of life! I like awesome street carnivals, they always bring a smile on people’s faces. I hope that this summer I will get time to go there with my friend, at least for one week. Summer is definitely the best time for street parties here! What a lively neighborhood! Can’t say mine in NYC is as dynamic but the Upper West Side has a lot of things going for it too. Like Gracia residents, A lot of native New Yorkers (which doesn’t include me since I’m from the burbs) will also say they are from Brooklyn, Queens, the Bronx, or Staten Island if they aren’t from Manhattan. Most people know when you refer to New York City or just “the city” you’re referring to Manhattan. Anything outside of Manhattan is referred to by the name of the borough. Oh yeah, I heard that about New York. I remember being confused forever about whether they were all separate cities or still part of New York itself! Thanks, Katharine! I’m sorry for the slow response, but I did walk by a textile shop in Gracia the other day called “Ikatten”. They might do more prints though, but the people there may know of somewhere else!